The Jugs MVP Baseball is our best baseball pitching machine, which is ideal for training kids and youth as well as junior batters, from ages 6 to 12 years old. It is meant to be a portable baseball pitching machine with a weight of only 56 lbs. The delivery system of this pitching machine allows you to easily see the ball all the time. Our step-up pick is the SportsAttack Junior HackAttack and the speed of this baseball pitching machine can go for up to 70 miles per hour or more for its fastballs. In addition to that, it is capable of throwing various kinds of pitches such as curveballs, right and left handed throws, knuckle balls, split fingers, sliders and the like. You can also configure it for line drives, ground balls, head pivots, pop-ups and so much more in various directions. The budget pick is the JUGS Lite-Flite Machine and this machine can reach up to 25 feet of distance with any ball. It is ideally used with both baseballs and softballs of regulation sizes. Because it is a lightweight machine, you can take it to your travels for the portability of practicing anywhere and anytime. Baseball practice can be hard if you don’t have a sparring partner, and this is where the baseball pitching machine comes in handy. The baseball pitching machine is a type of machine that automatically dispenses balls to throw and simulate a real pitch from a person. One of the key advantages and purposes of a baseball pitching machine is that it can help you practice for hitting a pitch. The problem with practicing pitch hitting is that you will have no one to practice with all the time. The baseball pitching machine is designed to do just that – which is why most baseball training centers have this kind of machine. In fact, pitching machines are not limited to baseball – even softball, tennis and the like all have pitching machines for practicing the player. 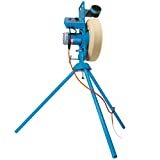 Any person can use the baseball pitching machine – whether you are a kid, a teen, an adult or a senior. As long as you want to practice hitting the ball better with your bat then a baseball pitching machine is a good choice for practice or simulation. It will help you to prepare for the worst and for you to correctly identify and address the different kinds of pitches. The baseball pitching machine has a loading mechanism that allows you to load up the balls and then it automatically fires them as if to simulate a real pitch from a player off a pitching mound in a real game. The speed of pitching of the baseball pitching machine can be adjusted depending on your skills. The good thing about using this kind of machine to train you is that you only need electrical source to power it up . The baseball pitching machine allows you to practice anytime and anywhere permitted, especially on training centers or gyms. Both baseball and softball hitting skills can be trained on a baseball pitching machine and this makes it a dual purpose machine for most training centers, sports centers or even at home when you want to master the art of batting. 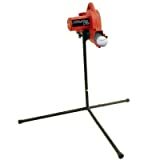 Some baseball pitching machines are also battery powered so you can use them anywhere while being portable. Speed options: the speed of the baseball pitching machine should be just fine and should not be too fast and not too slow. There should be speed options for you to choose so that the baseball pitching machine will cater to all skill levels, from beginner to expert, since not everyone can take a pitch from anyone, even a baseball pitching machine, with very fast speed as well as complicated rotations. Some machines can go from 80 to 100 mph. Pitching style: some baseball pitching machines are designed to do certain kinds of pitches, such as fast balls, curve balls and the like. It is important that you choose a baseball pitching machine that allows you to practice the pitching style you want to hit, so that you will be effectively training yourself on how to hit it with the sweet spot of your bat and not make a miss hit so as not to damage your bat altogether. Power options: the power options for the baseball pitching machine include battery operated ones or being plugged into an outlet. 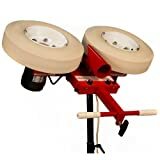 The battery operated baseball pitching machine is more ideal for mobility and portability for those who want to practice anywhere but the power plugged baseball pitching machine is ideal for unlimited practice times. It depends upon your preferences but the battery life of the portable baseball pitching machines can go for up to 12 hours or more. 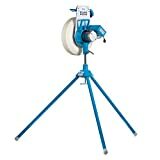 Portability: a baseball pitching machine that is portable will usually be easy to assemble and to fold down whenever possible. 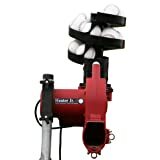 Moreover, a portable baseball pitching machine will usually be battery operated so you can use it from one training ground to another, allowing you to practice anywhere. This is especially the case for players who move from one state to another or to different countries for practice as well as for tournaments. Ease of use and setup: a good baseball pitching machine should be one that is easy to use and to put together so that it will not be too hard for the person who will use the machine to practice with a bat. Most baseball pitching machines have all of the parts in the machine and ready to assemble but it helps to have a machine that has clear and concise instructions with you. Compatibility with other sports: most baseball pitching machines can be used with softball as well so they are dual purpose as a pitching machine. This is because softball employs most of the similar pitches that you can use with baseball, and this is why a baseball pitching machine can be beneficial with other sports that involve pitching or throwing. Home or commercial use: do consider if the baseball pitching machine will be used for commercial purposes or simply for home practice. It will be more durable with parts if it will intended for a training center or commercial use, and can be more expensive as well. Warranty policy: most baseball pitching machines have specific warranty policies on the motor as well as on the parts, so make sure you check with your manufacturer on the warranty guide of the baseball pitching machine. The Jugs MVP Baseball is our best baseball pitching machine which is capable of going for speeds from 20 to 52 miles per hour (mph) so it is good as a basic pitching machine. It has a digital speed readout for you to use to identify which speed it is pitching on. You can use it for practice sessions and it has a base with an intuitive swivel design that can move up to 360 degrees. The machine can be powered at any 110-volt system or you can use a generator of at least 1,000 watts. Its motor is at 3 amps with 1 1/4 HP. It only requires easy setup for your area and it is backed by a warranty of 5 years. While not a deal breaker, the Jugs MVP Baseball, like all baseball pitching machines, can be quite expensive, but can still be a good investment if you’re in a team. The SportsAttack Junior HackAttack is our step-up pick, for when you want a really durable and fast speed for your pitching machine. It can be used by college players, high school players and professional batters as well. It can also be used on some youth leagues as well as for practice in your backyard. The compact design of this pitching machine also makes it easy to travel with so you can put it in small car compartments. You can also use it to simulate fly balls and is okay to use with machine balls and regulation baseballs. The JUGS Lite-Flite Machine is our budget pick which can go for up to 85 mph in its top speed so it is pretty fast. Its motor is at 1.3 HP so it is very powerful. 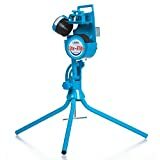 You can use this baseball pitching machine to practice hitting sliders, curveballs, left and right handed pitches, fastballs and the like. Super lightweight at only 35 lbs, this machine powers up on any 110-volt source and even has a 360 degree swivel function. It is backed by a 2-year warranty. 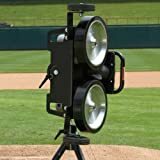 The Heater Sports POWERALLEY has a powerful motor of 1/8 HP and can reach speeds up to 45 MPH for baseball and 60 MPH for lite-balls. 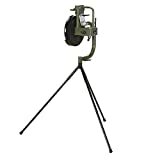 The steel tripod is durable and the housing is made out of nylon fiberglass for durability. It is able to throw ground balls, fastballs and pop fly balls. The ATEC M1 Single has a good center of gravity and is great for leagues and traveling. It has good accuracy due to the solid concave wheel and it has a speed range of 20 to 70 miles per hour. Ball visibility is good due to the ball chute design for effective hitting. The labels can be easily aligned to customize your pitch. You can choose between fastball and curveball with this machine. The BSN Ryan Baseball can reach 30 to 102 mph in speed and can throw knuckleballs, sinkers, sliders and fastballs. It can also throw dimpled balls and has urethane wheels for mobility and portability. It can also throw ground balls and pop-ups. The First Pitch TwoWheel can throw curveballs, fastballs and other pitches up to 105 mph. You can use it at home and it has a swivel function as well. The turret for the ball is ambidextrous for pitching and the machine has a 5-year warranty. The Heater Sports Jr. is a lightweight kid’s training machine that is portable with up to 12 balls for the auto feeder and speeds up to 48 mph. Its rubber tips make it steady and the tubular legs make it safe. It has a wheel that is enclosed and a height that is adjustable. The Jugs Junior Baseball is applicable for kids 6 to 15 years old and can reach speeds from 15 to 60 mph. it has a weight of 75 lbs for easy traveling. With a digital readout for displaying the speed, this baseball machine for juniors has a 5-year warranty. From the famous maker of baseball bats, the Louisville Slugger BlueFlame has a top speed of 45 mph for hard balls and 60 m ph for plastic balls. It throws almost any type of ball, from baseball to softball to dimpled balls. At less than 25 lbs, it is a manual pitching machine. Other baseball pitching machines were not ideal to buy or to invest in because they had faults in their mechanical operations and also didn’t have clear instructions on how to set them up. There were also limited options for the speeds and the settings of the baseball pitching machine. Q: What are the different types of baseball pitches and how do they look like? • Speed: the speed of a fast ball with a 4-seam quality is from 85 to 100 mph. It is also the fastest pitch in the game. • Movement: it is pretty much the most basic of all the pitches and the one of the hardest to avoid, since it has almost no movement. • Direction: a 4-seam fastball will usually be straight when it comes down to direction. It only curves a little bit when it almost lands to the batter’s direction. • Speed: the speed of a 2-seam fast ball will usually be from 80 to 90 mph, slower than the 4-seam fast ball. • Movement: The movement of a 2-seam fastball is downward and not straight, as compared to the 4-seam fast ball. The downward motion makes it curve more than the 4-seam fast ball as well. • Direction: It has a curved direction unlike the 4-seam fast ball and has a downward direction. It may tend to go into the RHH or right hand hitter zone. • Speed: it is not as fast as a 4-seam fast ball and can only go from 80 to 90 mph. • Movement: it runs fast but suddenly stops or slows down before the plate has been reached. • Direction: the splitter has a sudden stop so it tends to curve downwards as well, much similar to the 2-seam fast ball. However, unlike the 2-seam, it is straight much like the 4-seam fast ball. • Speed: the speed of a cutter pitch is somewhere between 85 to 95 mph, making it also incredibly fast compared to a slider but may not be as fast as a fast ball. • Movement: it moves more than a fastball so it may tend to go left and away from the right hand hitter. • Direction: the direction of the cutter is usually away from the right hand hitter and yet its direction is slightly straight but still curved in the end. • Speed: forkballs can be slow and can reach from 75 to 85 mph, making them slower than the other pitches. • Movement: the forkball moves with less action and goes on a slower rate when going downwards. • Direction: forkballs go straight but also downwards, similar to that of the 2-seam fast ball but on a slower rate. • Speed: the speed of a slider is pretty fast at 80 to 90 mph. It mimics both a fast ball and a curveball. • Movement: it slightly curves in the middle and goes downward with a curve. • Direction: it goes away from the RHH so it goes out of direction from regular straight throws. • Speed: curveballs can be slow, from 70 to 80 mph, but can be tricky to hit. • Movement: the unique thing about the curveball is the movement known as the 12-6 or the top to bottom drop that mimics the hands of a clock going from 12 to 6 ‘o clock. • Direction: it curves evidently, much like its name, and is still characterized by the 12-6 action. It goes straight, however, when it comes down to the RHH direction. • Speed: the slurve can move from 70 to 80 mph, much like a curveball. • Movement: slurves work on a movement called 11-5, as with the hands of the clock going from 11 to 5 ‘o clock, slightly curved compared to the 12-6 of the curveball. • Direction: slurves are curves with just a little tilt on it due to the 11-5 direction. • Speed: screwballs tend to be one of the slowest at 65 to 75 mph. • Movement: the movement is known as 1-7 which looks like the hands of the clock going from 1 to 7 ‘o clock. • Direction: it goes almost near the RHH and opposite of the direction where the slurve goes to. • Speed: a change-up is slow, like very slow, at 70 to 85 mph. It is supposed to trick the batter to think it’s a fast ball but is a change-up pitch. • Movement: it roughly moves the same with a fast ball but tends to curve more. • Direction: it also goes straight and not left-right, much like the fast ball. • Speed: it goes from 70 to 80 mph, which is also slow. • Movement: it goes to the RHH and works like a screwball. • Direction: it has a 1-7 direction similar to that of a screwball. • Speed: palmballs are slow at 65 to 75 mph, very slow compared to a fast ball. • Movement: it is thrown similar to the way a fast ball is thrown, like a change-up. The only difference is that your palm should grip the ball as tight as possible. • Direction: it curves upwards then downwards, much like a change-up, but slower. Q: How do I successfully hit the different kinds of baseball pitches? • Learn how to see the red dot, which is caused by the curveball spinning. However, if the player is good, the red dot won’t really be visible at all times so it’s all in the gut feeling. • A pitcher who isn’t very experience will keep the fingers to the curveball’s side, but experienced pitchers will hide them, so you won’t know. So again, it’s all in the gut feeling whether you think he or she will go for a curveball. • It helps to invest in a pitching machine that throws curveballs. You can go to a training center as well as they have pitching machines that do just that so you can get the feel of how curveballs work. • Look at the pitcher’s wrist – in a curveball, it will usually snap, compared to that of a fast ball. • You can also ask your coach or trainer to pitch a curveball for you to hit and practice hitting until you get it right. • The fast ball requires faster reflexes, especially with the 4-seam one, so you need to stay alert and have sharper senses, which comes with practice. • Look at the seams of the fast ball – a 2-seam one will sink easily but a 4-seam one will go straight on ahead. • The fingers of the pitcher are the key to knowing whether it is a change-up or a fastball: fingers on the front means that it is a change-up, otherwise it is a fast ball. • You can also identify the wrist motion and the spin motion of the seam if you’re really experienced with focusing on the pitcher. Q: How do I make the most out of a pitching machine? Beginners should start without the requirement of strides. This helps you to focus your attention more on the ball so you can hit it better with accuracy. The stride can come later on when you have felt the rhythm of the machine and hitting every ball with accuracy as you go. The adjustment of the speed is also crucial when you go off and use a pitching machine. This lets you step up your learning curve and you can also make the pitching machine more realistic. Have someone manually operate the speed to the pitching machine, if there is an option like that, so that you will feel like a real person is making a pitch with varying speeds. If the pitching machine that you are using does not have a speed adjustment, don’t worry – you can go through different training cages in a sports center to go for different speeds of pitching machines. This makes it easier for you to train for a more varied lineup of speeds from pitchers. If you compete in a league, you should get the average speed of all the pitchers so that you can have an approximate closest speed that will best suit you or your batters. This is why it is crucial for a radar gun to be in the training facility with the baseball pitching machine to measure the average player’s pitching speed. You must remember to hit the ball wherever it came from or where it was pitched from and follow the direction as keenly as possible with sharp eyes and reflexes. Slow and constant speeds are better for rhythmic training so that you don’t tend to hasten up in the middle of your training while waiting for a ball to be pitched. A slow speed also means that you can train for more hours hitting the ball to practice. The training speed or pitching speed can also depend on the common mistakes of the player. For example, if the player is too fast or impatient with ball waiting in real games, they can go for a slower pitch from the machine, and vice versa for those who swing late in actual baseball matches. Make sure you use and wear proper gear such as helmets when using the pitching machine. It is generally advised not to use aluminum bats because they can get damaged with frequent use of the machine. You can use a different kind of bat that is meant for pitching machines or one that you don’t mind using to get worn out and you won’t be using in a real game. There are also the machines that throw inconsistent speeds that make training more realistic, but can be dangerous to beginners. While these are okay for those who want to simulate the real baseball game and pitching of average or even professional pitchers, you should be careful because a mistake can lead to injury when you missed the ball. Q: Do professional players also use the baseball pitching machine? A: Yes, some major leagues also use the baseball pitching machine to analyze their hitting average and other stats. One of the good things they can pick out from it is how they can analyze every aspect of the pitch and how to hit it properly and improve their current techniques and knowledge in the game’s mechanics. Q: Why should I invest on or use a pitching machine? Pitching machines are good investments for an entire team. This is because instead of having to always approach the coach to practice a certain pitch and then hit it, the pitching machine does the job for you. However, if you are just an individual player, you can just go for a batting cage instead of buying an expensive pitching machine to save money. Nonetheless, for teams, it is very beneficial not just for the coach but also for the players. It can help train anyone with a desire to improve his or her batting skills. Take note, however, that it should not be used to replace actual human pitching, so it is more of a supplementary training equipment to enhance your batting average, precision and power. Q: What are the downsides of pitching machines? It does not replace a human pitch or an actual pitch in the game, so it is mostly for drills or supplementary training. Remember that a baseball pitching machine is not supposed to have a realism that can mimic a real person’s pitch. There are many factors to consider in a real pitch and the baseball pitching machine is mostly intended for drills and the basics as well as for strength and stamina training. It also does not give the player practice on proper stride and position. Most people, especially parents and coaches of children who play baseball, note that a baseball pitching machine does not actually simulate the correct position and stride of hitting a baseball and focuses more on hitting the ball in a rhythmic succession. Not all pitching machines are realistic enough to practice on. This is because not all baseball pitching machines have a speed that can be changed and this is true for most machines that are not very expensive. In addition to that, the continuous and redundant speed of most baseball pitching machines do not mimic the uneven pitches of real people and some are only limited to fastball and curveballs, thus they are only ideal for practicing the basic pitches. Baseball pitching machines can be expensive. Unless you are on a team, the baseball pitching machine can be expensive for the average player or individual, whereas he or she can just rent time in a batting cage instead. A baseball pitching machine is only applicable if you are on a team and want to practice all the members in batting without having to get the coach there all the time. Q: When should you use a pitching machine and when should you not use it? Q: What are the two types of pitching machines and how do they differ from each other? Variety of pitch types A wheel designed machine can throw different kinds of pitches other than the fast ball, such as curveballs, forkballs and sliders. The arm action machine is a type of baseball pitching machine that doesn’t really do the other pitches other than a fastball. Throwing mechanism A wheel designed machine can throw or propel the ball properly but is not as realistic as the arm action machine. The arm action machine is more realistic because you get to see the ball beforehand and it mimics the arm throwing of a real baseball pitcher. Q: How is a pitching machine different from a soft toss machine? A pitching machine is ideal mostly to build strength and endurance as well as hitting with the sweet spot better. It is more of a general machine in terms of training but is more powerful than the soft toss machine in terms of pitching power. The soft toss machine, on the other hand, is more ideal for practicing your swing rather than practicing on hitting the ball. It is meant to be a break from using the pitching machine. Q: What are players missing when they use a pitching machine? • Your timing and rhythm might not be the best with a pitching machine, unless you have one that uses an arm to pitch so you can time your swing better. • The release point might also be ruined when it comes down to using a pitching machine because it releases the ball quite differently than a regular player or pitcher would. • The spin of the ball might not be properly simulated by a pitching machine, unless you have one that can throw different kinds of pitches, such as the wheeled machines. • Speed is also something because not all pitching machines have a variation in speed, unless you have an inconsistent pitching machine that mimics the real pitcher. Q: How do I safely operate a baseball pitching machine? Make sure you use the right balls. Different balls have different requirements as stated in the manual as to what kind of balls can be loaded into the machine. This may include dimple style balls, leather baseballs or even tennis balls. Make sure you choose which ball you will put in it to avoid damage. The cords should be properly inspected for any damage. This is to make sure that the pitching machine does not cause any unwanted spark or fires that are dangerous. The rotating wheels should not be touched, if your machine is the wheel type. It is dangerous and you should only place the ball on specific parts of the machine that are otherwise safe. Make sure you use helmets and safety glasses when you are using the pitching machine. Having protective gear is important because it will keep you protected from potential injuries while using the baseball pitching machine. In addition to safety gear, having proper clothing such as tied hair and tucked clothes. Make sure to clean up the machine as instructed in the manual and lubricate anything that needs lubrication. Be sure to only use approved cleaning solutions to avoid harming any of the internal parts of the machine. There should be a pitcher’s screen when you are operating the baseball pitching machine for keeping you safe while loading the balls. As with all machines, you shouldn’t operate it while under the influence of alcohol or any form of drugs or medication. Q: What are the different kinds of hoppers that you can find in a pitching machine? Popularity A tube hopper is more common compared to a basket hopper on a pitching machine. The basket hopper is less popular compared to the tube hopper in a pitching machine. Space needed Tube hopper models do not take a lot of space so they are okay to use in small batting cages or training areas. Basket hopper models may take more space due to their size and the size of the baskets. Loading the balls Loading the tube hopper can be frustrating when it comes down to the tube mechanism. It can also be troublesome to keep reloading it due to the low amount of balls it can hold. Due to the high amount of balls it can hold, it should be loaded with many balls at once, making it also a daunting task for the basket hopper. Amount of balls Tube hoppers can hold small amounts of balls at once. Basket hoppers allow for more balls in just one basket. Pitch speed Tube hoppers might not have a pitch speed that matches with basket hopper pitching machines. Basket hoppers can have more pitching speed and a constant flow than that of tube hopper pitching machines. Q: Why should you load balls initially before actually using the machine? A: This is to test the machine to make sure that it is properly aligned. This kind of test should be done each time you want to change the speed of the machine and also when you are making any other new adjustments to the baseball pitching machine in general. Q: What balls do most pitching machines use? Q: Why should the pitching machine be at a constant or slow speed when pitching? A: A slow speed of pitching can help the batter to have more reaction time and to prepare for hitting a precise shot. Faster pitching doesn’t always mean the best so you can start off with minimal speed first. Q: What kinds of pitches can a baseball pitching machine do? Q: How much space do you need to set up a batting cage with a baseball pitching machine? A: It depends on your area or the speed of the pitching machine but at the very most, you should have at least 45 feet of distance from the pitching machine to the batter. This is to ensure that you are at a safe distance when you set up a batting cage whether indoors or outdoors. You can go anywhere from 48 to 60 feet if possible and if your environment permits. Q: What is the common speed that a pitching machine can go with? A: The common speed that a baseball pitching machine can go with is about 80 mph, which is the average pitching speed for most baseball pitches, regardless of pitch type. However, this can also depend on the type of ball you have. Q: Is it okay to use real baseballs in the pitching machine? A: It depends on your preferences but generally, it is much better to use machine pitching balls rather than your real baseballs, because baseballs can get worn out easily with the machine and baseballs can cost more than cheaper machine balls. Moreover, most machine balls are built for durability for machine use. Q: Aside from baseball, what other sports can benefit from a pitching machine? • Softball – softball pitching machines exist, and can have a different kind of pitching style compared to a baseball pitching machine as well as the balls. However, there are special baseball pitching machines that are hybrid and can be used for softball as well. • Tennis – some racquet sports like tennis can also make use of a pitching machine to simulate the impact or throw of balls much like in softball and in baseball. The Jugs MVP Baseball is our best baseball pitching machine with a 1 1/4 HP motor, good speeds and an easy-to-see ball before hitting.